Medium heavy-duty for factory, institutional and hundreds of other applications. 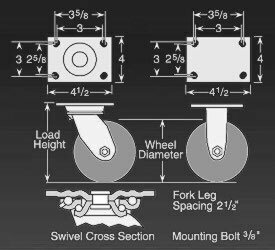 With a press of the foot, lock both wheel and swivel in any position. The low angle pedal design makes foot access easy for convenient operation. And, the contemporary design features thermoplastic construction to resist rust and corrosion. Hard tread rolls easily, provides excellent floor protection and very quiet. </li> <li>Resistant to oil, grease & solvents, animal fats and rejects metal chips. Good choice for intermittent water exposure.